A cookie is, by definition, a little cake and these luscious little Lemon Ricotta Cookies are exactly that. The idea for them came about recently when my husband was out of town for work. Whenever he travels, he calls us phone in the evenings to catch up on our days. Tuesday night was unusual. He asked how we were and chatted with Daisy for a bit while. When I got my turn to talk to him, he asked how my day was, then went on and on about some cookies some lady in Ohio had made. Frosted, lemony and more cake than cookie, these things were the bomb-diggity, he said. Just as I was booking a flight to the Midwest to bribe that woman for her recipe, I figured a good recipe to test for lemon ricotta cookies. For the finishing touch, they were crowned with homemade lemon buttercream frosting and a sparkly candied rose petal made by our sweet little Daisy. Now, that’s proof I love my husband. Baked goods are forbidden fruit at our house. My husband is training for a 24-hour mountain bike race this Fall and finds sweets too tempting. I’m Armenian and my people practically live on pastry. Plus, we love to entertain and I like to have something on hand for last-minute guests. So, this is what we do. He leaves town for a few days for work and that’s when I get to do some baking. Daisy and I will be doing some serious recipe testing. We need to crack down on Lemon Ricotta Cookies to surprise Daddy when he comes home. I love any recipe that comes from someone’s grandmother, anyone’s grandmother. Grandmothers are extra-special. They are like Mom, but without all the rules. They let you help them do stuff, like water the flowers and don’t get fussed if you get drenched. They love an extra set of little hands “helping” make something yummy, even if you dust the kitchen floor with flour. And everything they make is delicious. The dough for these Lemon Ricotta Cookies can be made up to a week ahead and kept chilled in the fridge until ready for baking. That makes it ideal for the busy holidays, celebrations or when those wicked little cravings strike. It also yields plenty for sharing with your neighbours and sending home with your guests. Take butter out of the fridge for it to warm to room temp. If you’re in a hurry, grate it so it softens right away. Combine flour, baking powder and salt. Set aside. These are your dry ingredients. Blend ricotta and lemon zest into butter + sugar. Scrape the sides of the bowl every now and then. Slowly incorporate dry ingredients and mix until just combined. The dough can be stored in an airtight container for as long as a week. Line baking sheets with parchment papers. Using a small cookie scoop or tablespoon, roll dough into balls. Arrange them 2″ apart on the baking sheets. Transfer the baking sheet to the fridge and chill the batter balls for at least 15 minutes. While the batter is chilling, make the frosting. Cream butter, powdered sugar, lemon zest + juice, rosewater and salt until smooth. Cover and store in the fridge until ready to dress the cookies. Remove baking sheet from oven and allow the cookies to cool at room temp on the cookie sheet for 5 minutes. Transfer them gently to a metal rack to finish cooling. Once the cookies are completely cooled, frost and decorate with candied rose petals. Old fashioned food makes me think of grandmothers with delicate hardworking hands, a humble gold band around the left ring finger. There is a lot of kindness in those hands. Over time, whether they loved cooking or not, most ladies take on the nurturing role of caring for their families. Food is at the heart of that love. 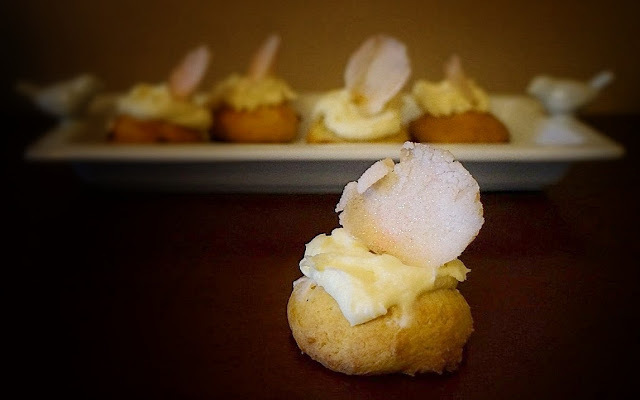 These Lemon Ricotta Cookies are the sort of thing that comes from an Italian Nonna’s kitchen. Tender, sweet with just the right amount of lemon, they will take you back to sunny Capri with the first bite. Oh my, I’m drooling over here! I LOVE anything lemon! Wow! My wish is for you to provide a weekly dessert for my tummy. Btw, a 24 hour mountain bike competition? Where do my boys sign up?